Survivor: Vanuatu (2004) - 6th place, 13th out - 4th juror. Voted out in Episode 12, "Now Who's In Charge Here?" (Day 33). Survivor: Micronesia-Fans vs. Favorites (2008) - 11th place, 10th out. Sent to Exile Island (with Kathy) in Episode 3. Cumulative longevity: In-game - 20 days; Exile Isl. - 1 day. Voted out in Episode 8, "A Lost Puppy Dog" (Day 21). Vanuatu Ep. 2 RC: "By the Numbers" - Yasurs all get across; Yasur wins again. Vanuatu Ep. 2 IC: "Four on the Floor" - Tethered to Twila and Leann; thanks to Scout's forgetting a piece, Yasur loses. Vanuatu Ep. 4 RC: "Remembrance" - Makes the first match, Yasur wins (Dah!). Vanuatu Ep. 4 IC: "Tribal Tiles" - Places tiles for Yasur, and Yasur wins again. Vanuatu Ep. 5 RC: "Dive Masters" - Now with New Yasur, which is much worse than the old version. Yasur loses. Vanuatu Ep. 5 IC: "Outwit, Outplay, Outrig" - Retrieves the frame & paddles with Bubba, but Yasur loses again. Vanuatu Ep. 6 RC: "Pig Pen" - Carries pigs, Yasur loses again. Vanuatu Ep. 6 IC: "Strung Out" - Moves the float well enough for yet another New Yasur loss. Vanuatu Ep. 7 RC: "Jo Coconut" - Competes, and somehow, New Yasur wins! Coffee! Vanuatu Ep. 7 IC: "Shoot Your Way Home" - Shoots a slingshot at plates, Yasur wins (narrowly) again. Vanuatu Ep. 8 RC: "Fire Fighter" - New Yasur saves one last loss for the final tribal challenge. Vanuatu Ep. 10 RC: "Sacrificial Lamb" - Part of the winning team, with Chris, Chad, and Eliza. Vanuatu Ep. 8 IC: "Jumper" - Second in the first-round heat & advances to finals, where she and Rory trail Sarge (tie-2nd/10). Vanuatu Ep. 9 RC: "Head Hunter" - Takes out Sarge, ends up in third place (3rd/9). Vanuatu Ep. 10 IC: "Get A Grip" - No elapsed time shown, but fourth to drop out (5th/8). Vanuatu Ep. 11 RC: "Played Out" - gets six right, just misses the tie-breaker round (tie-3rd/7). Vanuatu Ep. 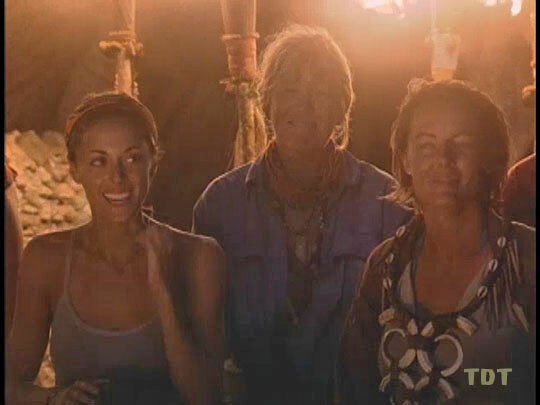 11 IC: "Love Is Blind" (with loved ones) - with Crissy, first to start the puzzle, and Ami wins (1st/7). Vanuatu Ep. 12 RC: "Bridge Over Troubled Water" - Finishes second, which qualifies her to join Eliza (and Chris) on the reward (2nd/6). Vanuatu Ep. 12 IC: "Island Hopping" - does not win. Micronesia Ep.1 RC/IC: "Reinventing the Wheel" - Carries the flag for Malakal, Malakal loses. Micronesia Ep.3 RC: "Beach Bash" - Competes, Malakal wins, Ami's reward is getting exiled. With Kathy. Micronesia Ep.3 IC: "Nut Bucket" - Shoots baskets, but Malakal's four can't hold theirs. Malakal loses. Micronesia Ep.4 RC: "Diver Down" - Retrieves 2 of Malakal's 10 coconuts; Malakal wins. Micronesia Ep.5 RC: "Cat and Mouse" - Now switched to New Malakal, which loses. 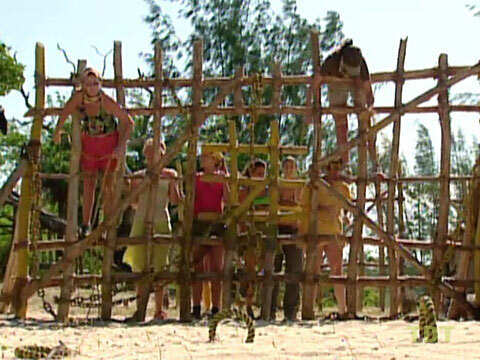 Micronesia Ep.6 RC: "Build It Up, Break It Down" - Another Malakal loss. Micronesia Ep.7 IC: "What-Er Drag" - Malakal resumes its losing ways. Micronesia Ep.8 RC/IC: "The Gauntlet" - Malakal loses again. Micronesia Ep.1 Individual IC: Does not find Malakal's necklace/idol thing (bottom 8/10). Vanuatu, Ep. 5: Travis 'Bubba' Sampson (voted out, 6-1). Vanuatu, Ep. 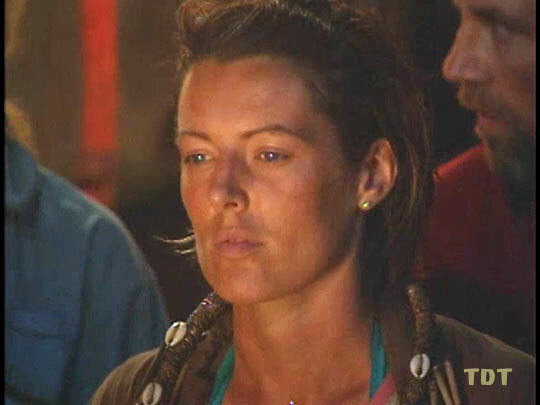 6: Lisa Keiffer (voted out, 4-2). Vanuatu, Ep. 2: Four votes, from Julie, Lisa, Mia, and Dolly. Vanuatu, Ep. 11: Four votes, from Chris, Twila, Scout, and Eliza (voted out, 4-3). Vanuatu, Ep. 14: Voted for Twila Tanner (who lost, 5-2). Micronesia, Ep. 8: Four votes, from Amanda, Cirie, Erik, and Ozzy (voted out, 4-1). Hey, everyone got one right! Ha ha! Eliza was so mad at the reward challenge! A Pontiac? Eh, you can keep it, Probst. Listening to Penner argue with Cirie. Yay. Rene Syler at CBS's The Early Show (12/2/04): "Ami on Survivor Shocker"
Angel Cohn at TVGuide.com (12/8/04): "Survivor Schemer Ami Tells All"
David Bloomberg at RealityNewsOnline (12/11/04): "'I Felt As If I Had Too Much Input': An Interview with Survivor's Ami"
Pre-Micronesia interview with AfterEllen.com (2/7/08): "Interview with Ami Cusack"
Gina Scarpa at BuddyTV.com (4/4/08): "Ami Cusack of Survivor: Micronesia"
Eric Goldman at IGN.com (4/9/08): "Survivor: Micronesia Interview - Ami"
"Ami Cusack was born and raised in Golden, Colorado, to Richard, a top gun pilot and explosives engineer, and Virginia, a former substitute English teacher and homemaker. After graduating Golden High School, she attended Rocky Mountain College of Art and Design in Denver. In 1992, while attending RMCAD, Cusack became one of the original six employees of a Golden-based nutritional company called Experiment and Applied Sciences. She started out by answering phones and by 1996 she became the company's charitable director. In 1998, (with over 350 employees), the company was sold and Cusack decided to travel for the next four years. Her travels led her to Australia, Thailand, Tahiti, Iceland, Japan and Africa. Upon returning to the US, she took a job at a coffee shop which she now considers 'the greatest job in the world.' She looks forward to being a mom and taking care of her family. In 1996, she lost her 18-year-old younger brother, Kyle, to a drunk driver. Her mother now conducts motivation speaking to high school students about the consequences of drinking and driving. Cusack is currently dating Crissy, whom she's been with for three years. Her birth date is January 25, 1973." Upon returning to the U.S., she took a job at a coffee shop, which she now considers 'the greatest job in the world.' She looks forward to being a mom and taking care of her family. She also is a nanny for a six-year-old. She is still very active in charities and has been named an Ambassador for the Colorado Chapter of the Make-A-Wish Foundation. Cusack is currently single. Her birth date is January 25, 1973."